A rising window is usually found in bullish surges where the price is rising quickly. The pattern represents a “break in the market” where the price gaps upwards – often on a positive news release. 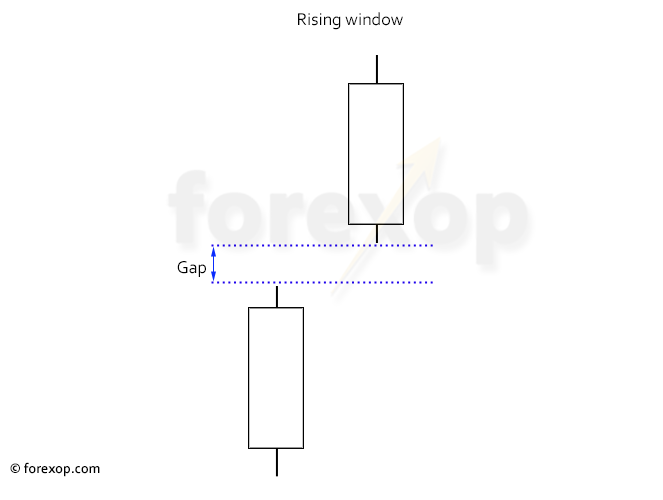 A rising window happens when at least two neigbboring candlesticks become disjointed. When this happens in a rising chart, a gap appears between the high of the first and the low of the second bar. The bars of the candlesticks can be either black or white. But more weight is normally given to formations where they are white or bullish. These patterns are more commonplace when there is a session close between the two “gapping” candlesticks. For this reason they are more typically seen on the daily charts of exchange traded instruments such as stocks or futures and are less common in spot forex. With a rising window, the market dynamics are very similar to the falling window except that sentiment is bullish at the time of the formation. Rising windows can occur in any market but they are especially common when liquidity is low and the price is adjusting to new information. For example, that can be after an important economic data report. When this happens, you’ll often have wide gaps between candlesticks. 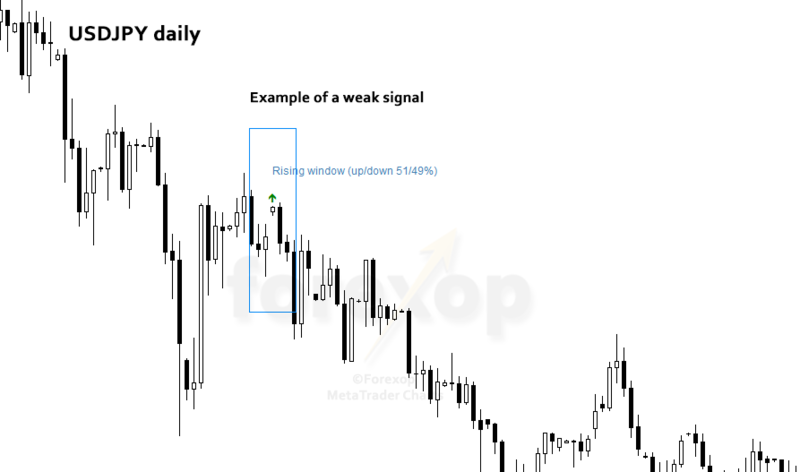 When a significant rising window completes, the top of the first candlestick may develop into a support line. When a market closes overnight or over a weekend, it’s normal for there to be some deviation between the close price and the open price. Volatility is still present even when a market is closed. This is normal “market closure volatility” and we have to allow for that when trading these patterns. When trading a rising window, it’s the more convincing cases that we’re interested in. Rising windows are not necessarily bullish signals. There are several features of these patterns that should always be examined beforehand so that the weaker cases can be ignored. Is it forming as a continuation of an uptrend? The chart in Figure 3 shows a weaker case on USDJPY daily. 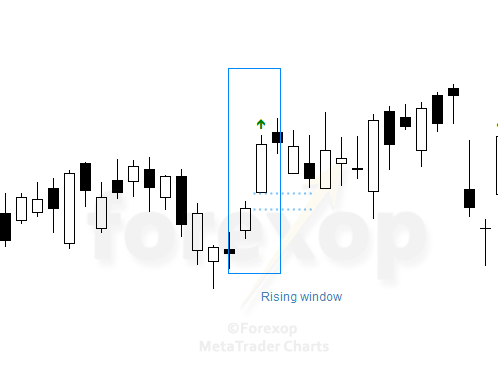 In this example the rising window appears in a strong downtrend. The size of the two bars that make up the formation are relatively small and don’t suggest a convincing swing to bullish sentiment at this point. And the earlier bullish breakout, marked by the long bullish candlestick, appears not to be gaining any further momentum. Moreover the breakout direction probability is nearly evenly split at 51/49%. These factors together mean that this case is too weak a signal to trade on. Any rapid price move always has the potential for a pullback also known as a kickback. This is a “mean reversion” and it is a tendency for the price to deviate back to where it came from. This may happen, even if the trend does ultimately go in the expected direction. Generally speaking, the bigger the price move, the higher is the chance of a retracement of some of that move. Pullbacks create serious difficulties for short-term trading strategies because they will take the position into drawdown, even if just temporarily. 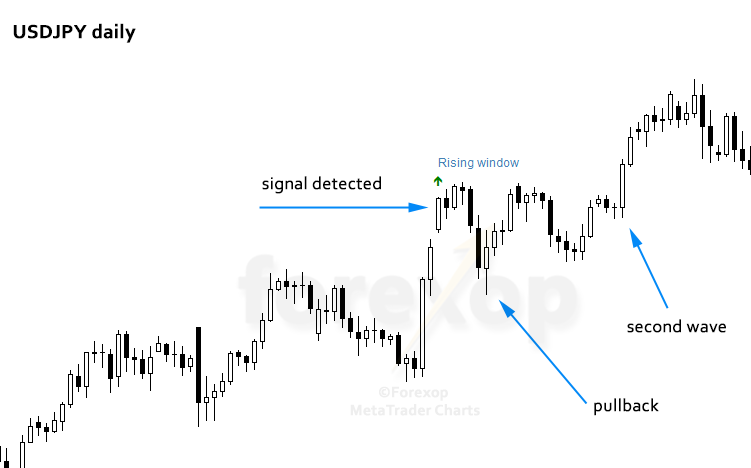 So when entering a trade we have to be aware of the potential for a pullback immediately after the entry point. There are several ways to do this, although it has to be said none are foolproof. The simplest is just to wait for a pullback to develop and then enter the trade as the second wave starts to form. An example of this is shown in Figure 4. But there’s always a downside to risk-averse trading, and that is the possibility of missing a really big breakout should it happen. Japanese candlestick patterns hardly ever appear in isolation. There are always many other clues in the chart and in other sources that we can check so as to better predict which way the market will go. While we can’t ever be one hundred percent sure, there will always be good cases and bad cases. 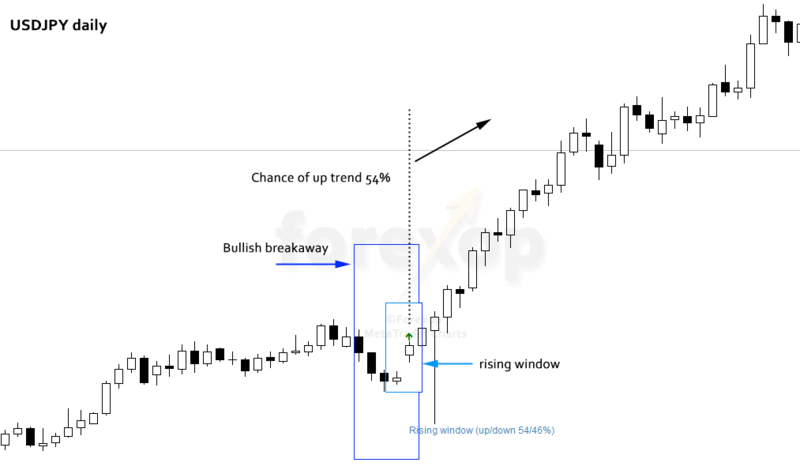 The rising window in Figure 5 appears as part of a larger pattern, namely a bullish breakaway. Here an upwards trend is already establishing itself. Following on from the rising window we see a bullish hammer which rebounds off of a very strong long-term support line. This gives a further indication that sentiment is turning bullish. The rising window doesn’t lead to a significant move in price here so we could potentially enter long just after the signal appears. Entering just after the bullish hammer would also be a good tactic here. 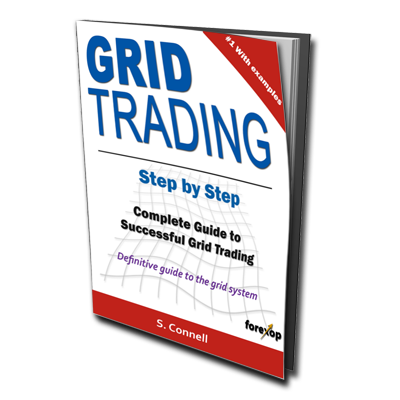 This ebook is a must read for anyone using a grid trading strategy or who's planning to do so. Grid trading is a powerful trading methodology but it's full of traps for the unwary. This new edition includes brand new exclusive material and case studies with real examples. This one comes in a shock. I’ve been trading for 2 years and I never noticed these candles so close. Had I knew all these initially, I’d not have lost so much money trading. I’m going to keep my eyes on candles now. What I conceived from this blog post is very worthful and I am sure, after incorporating this strategy for my investments, I will have a better insight and avoid doing mistakes I did earlier. Thank you for doing research and sharing it with us.